The National Chairman of the party, Uche Secondus, made the party’s position known while receiving a delegation of the United Nations, led by Mohamed Ibn Chambas in Abuja. The Peoples Democratic Party on Wednesday said it did not have confidence in the Independent Electoral Commission. He called on the United Nations to intervene to prevent rigging during the 2019 general elections. Secondus said: “The new leadership of INEC, after the 2015 elections, has conducted series of elections; they have done their best but much is left to be desired. “INEC must come out clean and clear for all parties to have confidence in its ability to conduct a free and fair elections. “For us in the PDP, INEC has not given us the required confidence; we do not have confidence in INEC and that is one area we want the UN to intervene. The chairman urged the UN to intervene in the issue bothering on the registration of underage voters in Kano and other parts of the country. He said the National Assembly should carry out its statutory duties of amending and making laws which included the Electoral Act. The chairman said that the PDP was ready to obey any law passed by the legislature and that the party was ready for victory no matter the sequence of election. He said the party was interested in youths and women participation, adding that the party had put structures in place to aid the process. Secondus said the party was ready to work step by step with all stakeholders to address all possible challenges before the next general elections. He said that the timely intervention of the United Nations would go a long way to restore confidence and to ensure free and fair elections. 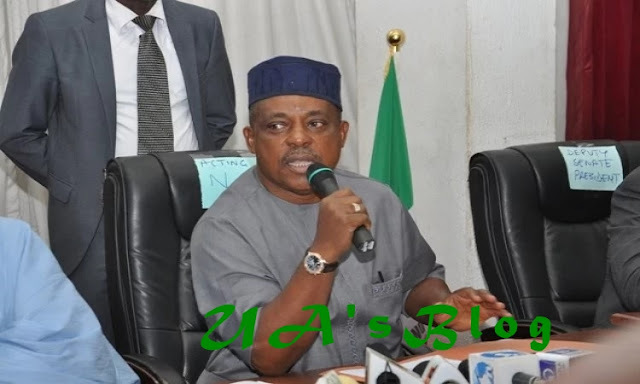 Secondus said that the high rate of bloodletting and insecurity in the face of economic difficulty could also affect free and fair elections. Earlier, the leader of the delegation, Mohamed Ibn Chambas, said that the visit was in connection with the 2019 general elections. He said that the United Nations desired early engagement with stakeholders for effective preparations. Chambas said that the UN believed that peace was better than peace-keeping missions. Chambas said that there were no fewer than 100,000 peace keepers across the globe and that it was very expensive, stressing the need to scale up preventive measures. He said giving the role Nigeria played in West Africa; the UN was interested in a strong, stable and peaceful Nigeria for the benefit of the sub-region. The UN official said due to the successes of the 2015 general elections, the world body had continued to use Nigeria as a yardstick for other African countries. Chambas said the UN was willing to partner with all stakeholders in Nigeria for successful elections in 2019. He said there was need for a consensus of all stakeholders around INEC as the referee for a free and fair outing in 2019. He said there was need for all stakeholders to review the ongoing Continuous Voter Registration, to improve it. Chambas called for a speedy passage of electoral bills pending at the National Assembly, including the Not-too-young-to-run bill ahead of the 2019 elections. The UN official said that West Africa was lagging behind in women representation at the polls and called for more women flag bearers in the political space. He stressed the need for increased funding for INEC, to enable it to carry out its statutory duties and urged the major political parties in the country to sign a Code of Conduct before the elections. Chambas called on all stakeholders in the politics sector as well as religious leaders to collaborate with the UN to achieve a competitive, free and fair election in 2019.